website for visitors to read, observe and enjoy. in celebration of our older creative artists.
! Watch this space ! artworks and opportunties to contribute. and enjoy the company of other writers. in a small Scottish town teeming with writers. 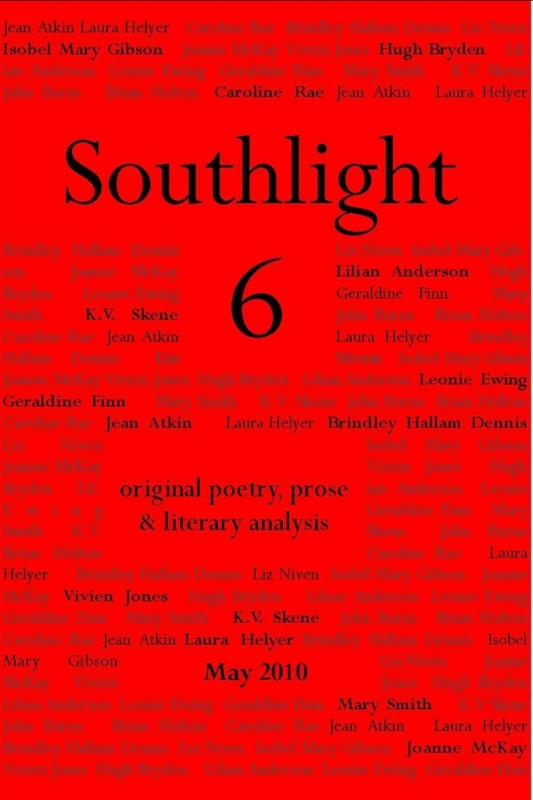 'Southlight 19' is nearly here and will be launched on the morning of Sunday 17th April (10.30 am) at The Big Lit Festival in Gatehouse of Fleet in the Old Mill of Fleet - do come if you are a contributor of this and past issues and read a poem or two - come for the crack with other writers and the editors, come if you like to hear poets reading their work. Also in the morning session will be short readings from two of the Scottish Llamas (that is, poets who live in Scotland but are published by Cultured Llama Press, a lively independent press in Kent) Julian Colton and Vivien Jones - and there will be an open stage session to finish where anyone may read, recite or try out a new work. A great weekend ahead www.biglit.org for the whole programme. The Swallow Theatre presents a workshop led by Hookhitch Theatre Company (My Friend Peter, This was the World and I was King) focussing on writing for the stage. Explore techniques for generating and developing ideas, creating character and structuring a script with the scriptwriter of ‘My Friend Peter’ (a play about the life and works of Beatrix Potter being performed at The Swallow Theatre on Saturday 9 April at 7.30pm and Sunday 10 April at 3pm). The 90-minute workshop is intending for writers with some experience (recommended ages 15+). – an endearing play incorporating storytelling, drama and specially composed folk songs about the life and work of Beatrix Potter. This show will appeal to adults and children alike. Family Puppetry Workshop – join the puppeteers from My Friend Peter to explore the techniques and skills of puppetry. Creative Writing Workshop - Join us for an advanced workshop led by the writers of MyFriend Peter focussing on writing for the stage. We are delighted to announce the writers and editors who will be leading sessions at this year's Writers' Gathering in Wigtown on Saturday 9 April. Full details and booking information are below. 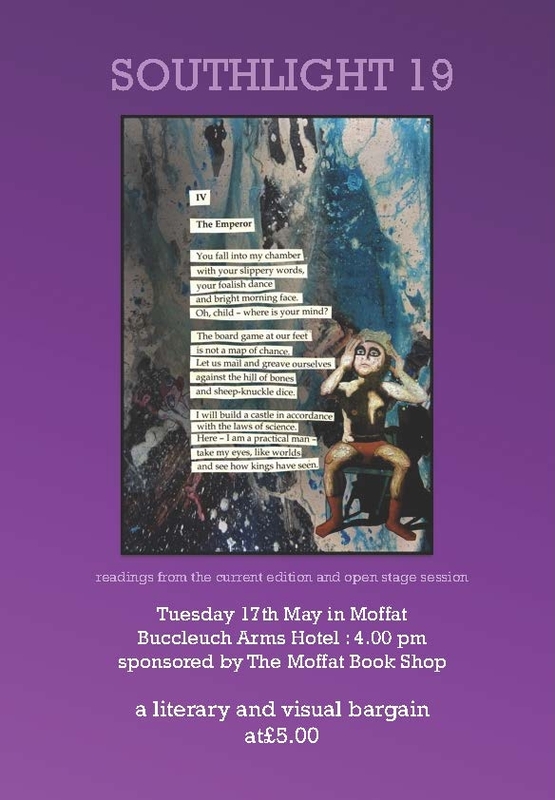 In addition, you'll also find details of the (free but ticketed) Dumfries Literary Salon taking place on Thursday 17 March at The Stove in Dumfries. We hope you'll be able to join us. £25 / free for under 25s (includes lunch). Spaces limited. 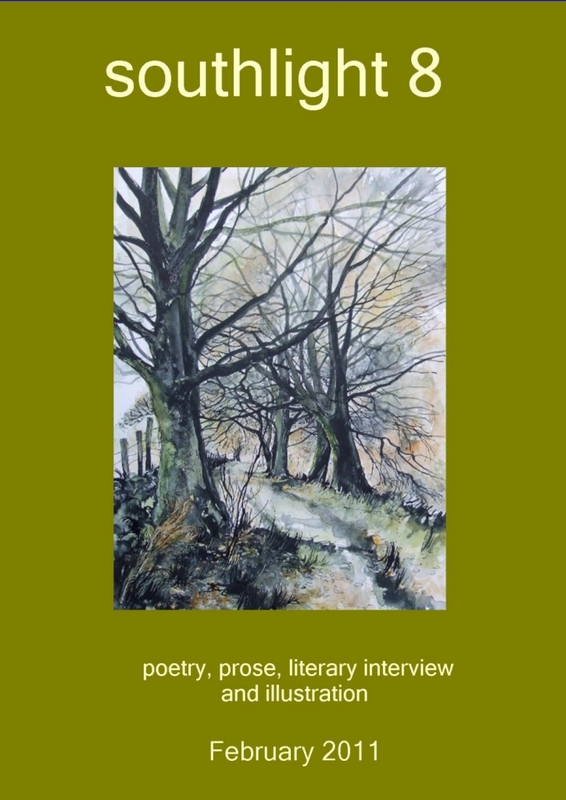 Lesley Glaister is an award-winning novelist, poet and playwright. She has written 13 novels, Little Egypt being the most recent, one play and numerous short stories and radio plays. Lesley is a lecturer in creative writing at the University of St Andrews, and is a regular contributor of book reviews to The Spectator and The Times. 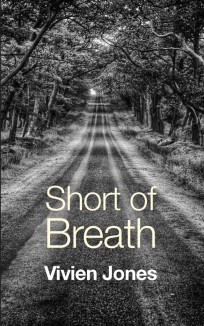 Andrew Greig is one of Scotland’s most multi-faceted writers. His first book was the poetry collection White Boats and his novel In Another Light won the Saltire Society prize in 2004. He has also had success with mountaineering titles, including the acclaimed Summit Fever. Andrew is a former Glasgow University Writing Fellow. He studied Philosophy at the University of Edinburgh and held a number of part-time jobs before turning to writing. 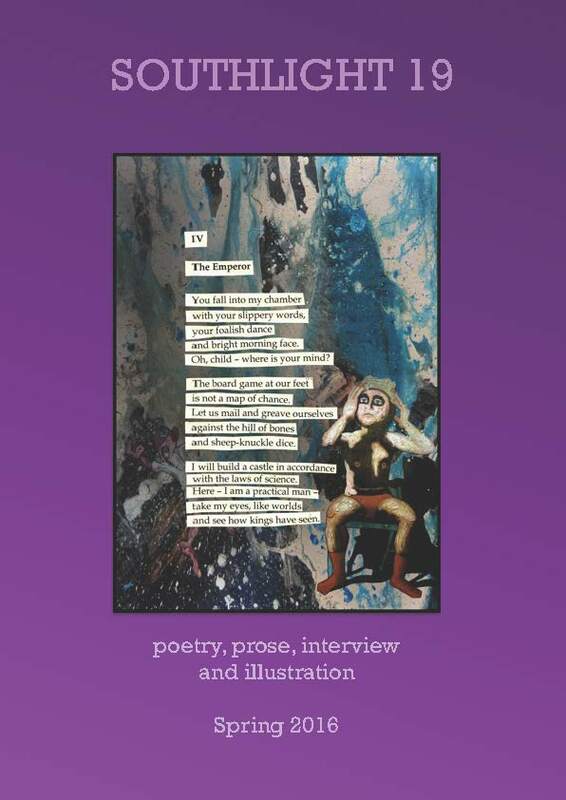 James T Harding is co-founder (with Rachel McCrum of Rally & Broad) of the award-winning Stewed Rhubarb Press, an innovative small poetry press based in Edinburgh, which specialises in publishing pamphlets by spoken-word artists and performance poets. 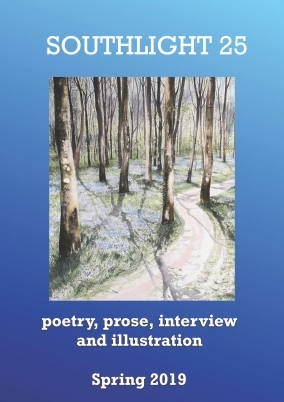 He will be focusing on routes to publication and how to create a collection. Chitra Ramaswamy is an award-winning journalist with more than 10 years' experience. Formerly a columnist at The Scotsman, she writes for numerous national newspapers. Published this year, her memoir Expecting: The Inner Life of Pregnancy has been called "extraordinary" by Denise Mina and Sara Maitland alike, while The Guardian's Zoe Williams described it as "immediately, poignantly, gripping...magnificent". Chitra will be leading a session on creative non-fiction. 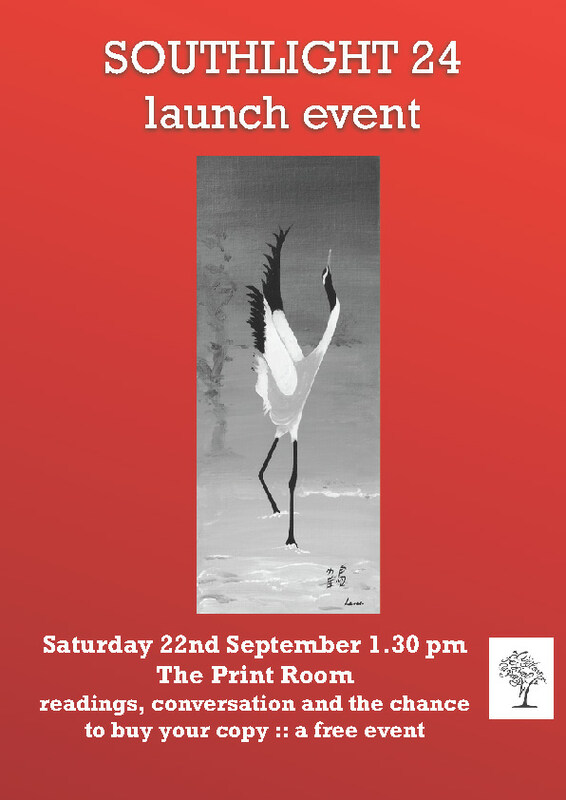 The new Dumfries Literary Salon is an occasional evening for anyone in Dumfries & Galloway who cares about good writing. 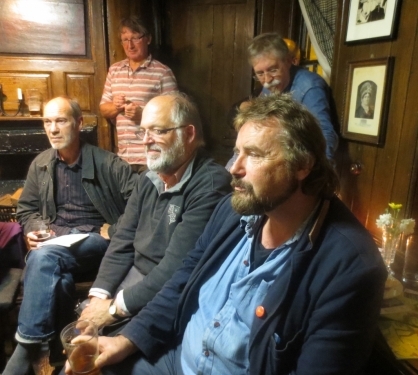 Organised by Wigtown Festival Company, with the support of the artists' collective The Stove, it's a chance to listen, discover new writing, and mingle with likeminded people in an informal setting. And it's completely free. 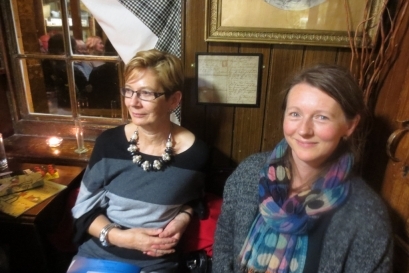 In our first event, we talk to novelist and playwright Catherine Czerkawska about her quest to understand Robert Burns' wife, Jean Armour, subject of her upcoming novel, The Jewel. Edinburgh International Book Festival director Nick Barley discusses his role running Scotland's prestigious literary gathering. The very talented and funny Kevin MacNeil imagines a very different kind of festival in his new novel The Brilliant & Forever. Set on a book-loving Hebridean island, it features a literary talent contest featuring three best friends - two humans and an alpaca - and asks, among many other things, "What's the point of culture?" Chaired by Peggy Hughes. The evening will last about 2 hours and will provide plenty of opportunities to socialise. The guidelines below apply to online entries. 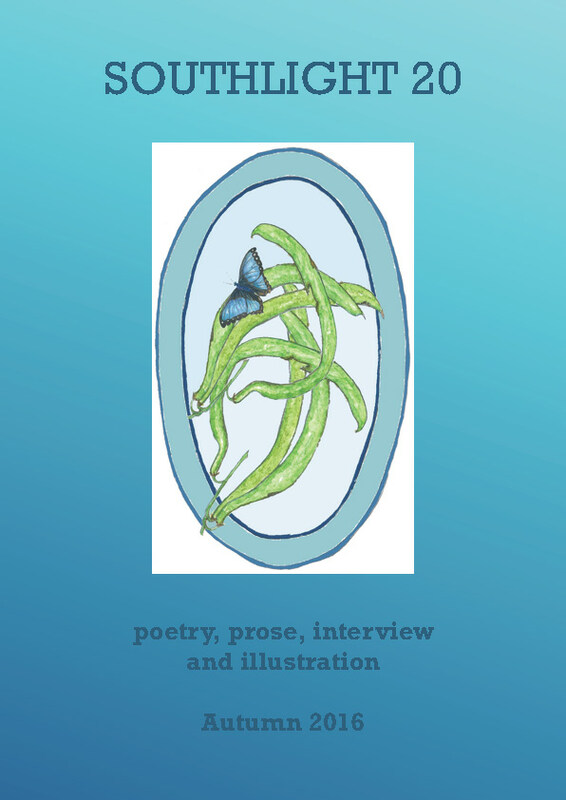 Poems must not be previously published, accepted for publication or currently entered into another competition. 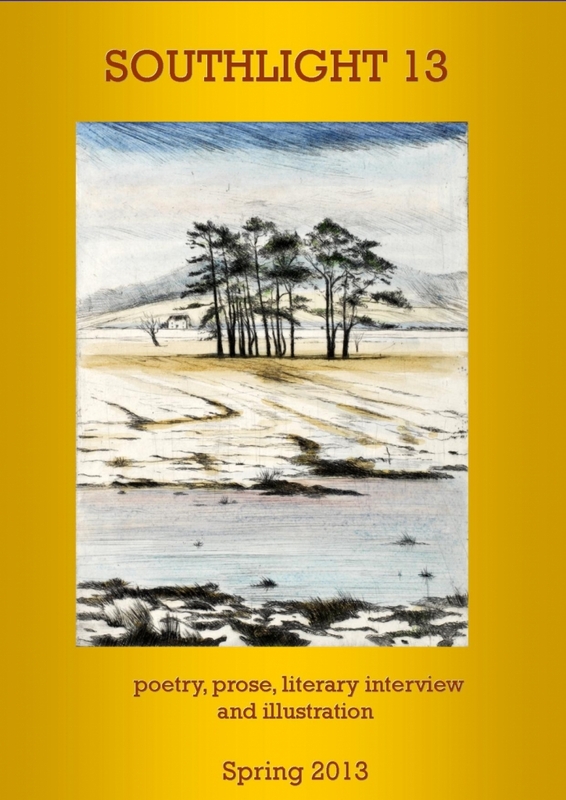 If your poem is published elsewhere between being submitted for this competition and Friday 12th August 2016 when winners will be notified, it must be withdrawn from Wigtown Poetry Competition by emailing: mail@wigtownbookfestival.com. 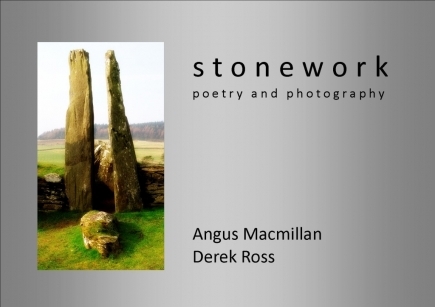 Each poem must be saved in a separate Microsoft Word document (.doc format) and the entrant must indicate which part(s) of the competition it is entered for (Main Prize, Scottish Gaelic or Scots), using the categories supplied in the online entry form. 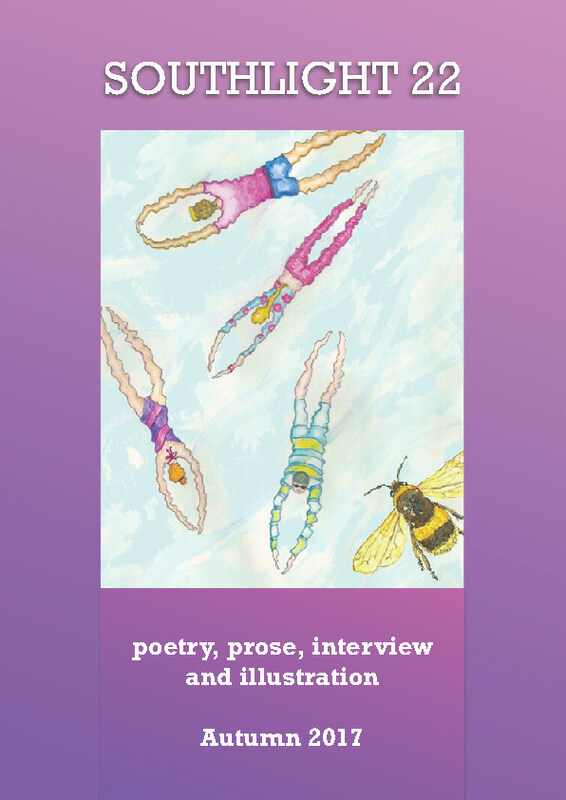 The same poem can be entered for more than one part of the competition but it must be entered individually under each category in the online entry form and will be counted as a separate entry. 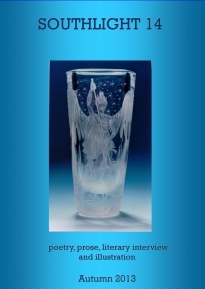 Poems must not exceed 40 lines (not including title). There is no theme - your poem(s) may be on any subject of your choosing. All entrants must be 16 years of age or over. Entries may be in English, Scottish Gaelic or Scots. The competition is open to anyone throughout and outside the United Kingdom. 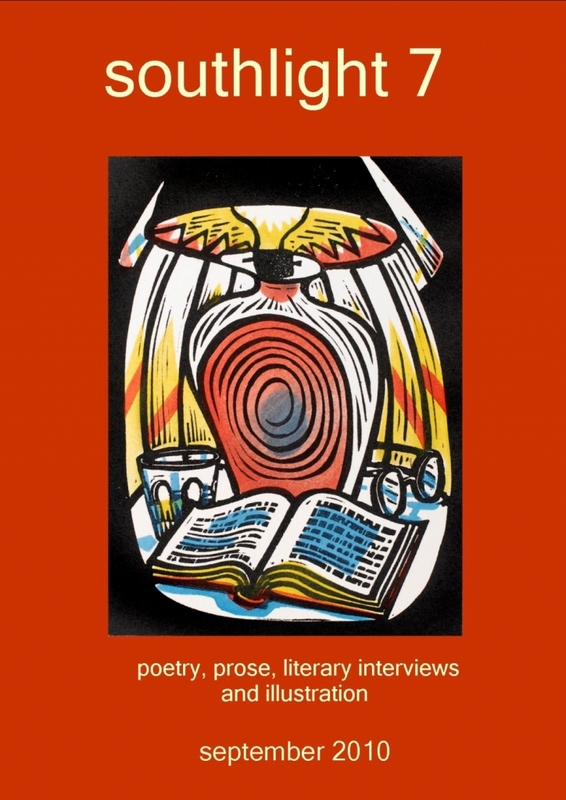 There is no restriction on the number of poems submitted by each applicant to each category of the competition, provided the appropriate entry fee is paid. 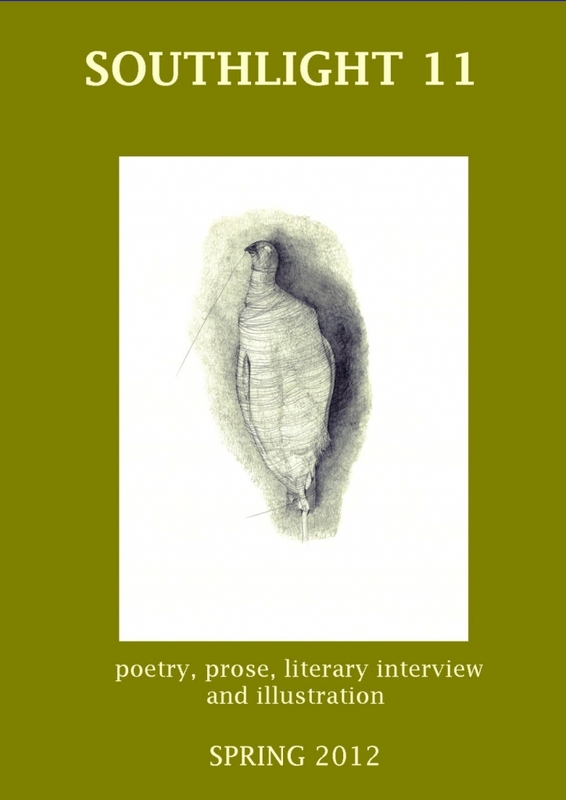 Alterations cannot be made to poems once they have been submitted. 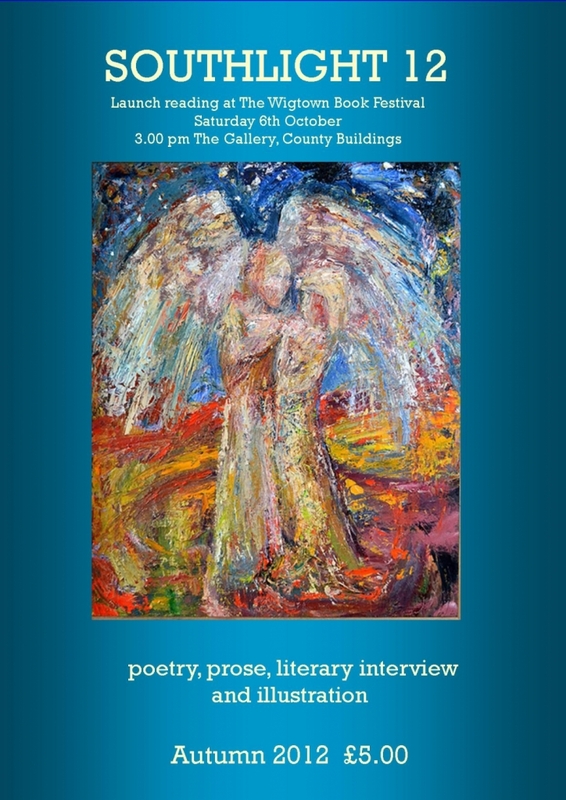 All Main Prize Entries will be read initially by the Scottish Poetry Library who will create a short leet prior to the final judging. Closing date for entries is Friday 27th May 2016. No entries will be accepted after this date. Winners will be noti%uFB01ed by Friday 12th August 2016. Winners will be listed on the Wigtown Book Festival website from Friday 16th September 2016. The judges’ decision is %uFB01nal and no correspondence will be entered into. 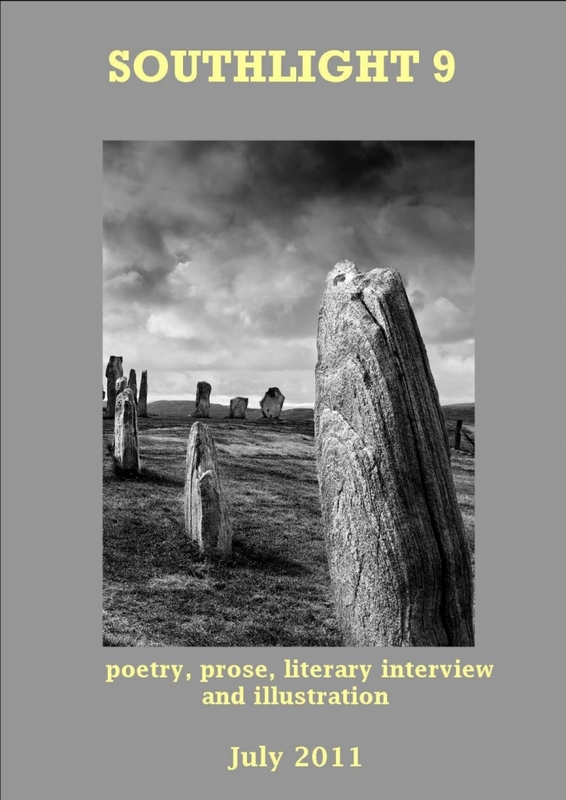 No employee or board member of Wigtown Festival Company, Saltire Society, Scottish Poetry Library or The Gaelic Books Council may enter the competition. 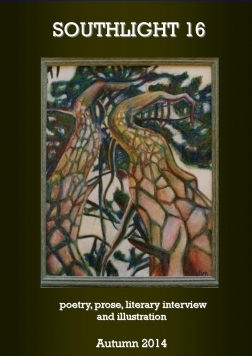 The copyright of each poem remains with the author. 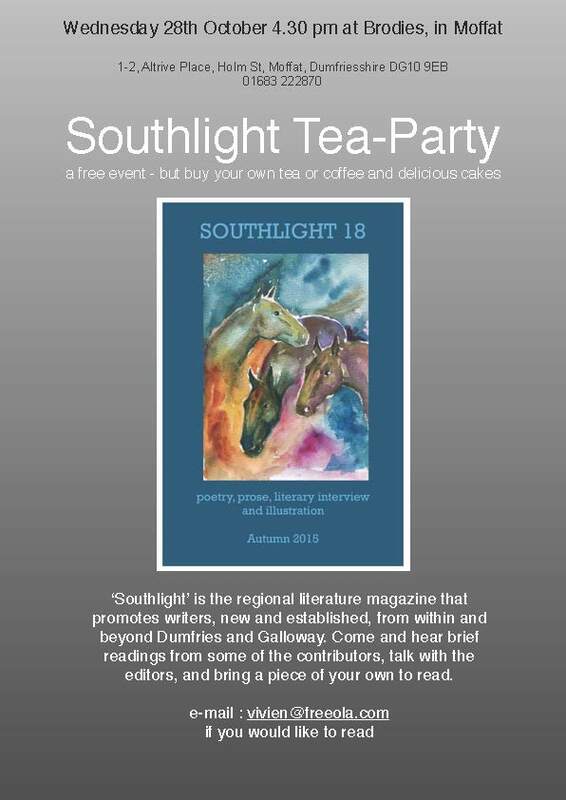 The authors of the winning poems grant Wigtown Festival Company the right to use the poems, including in Southlight Magazine for one year from 16th September 2016. 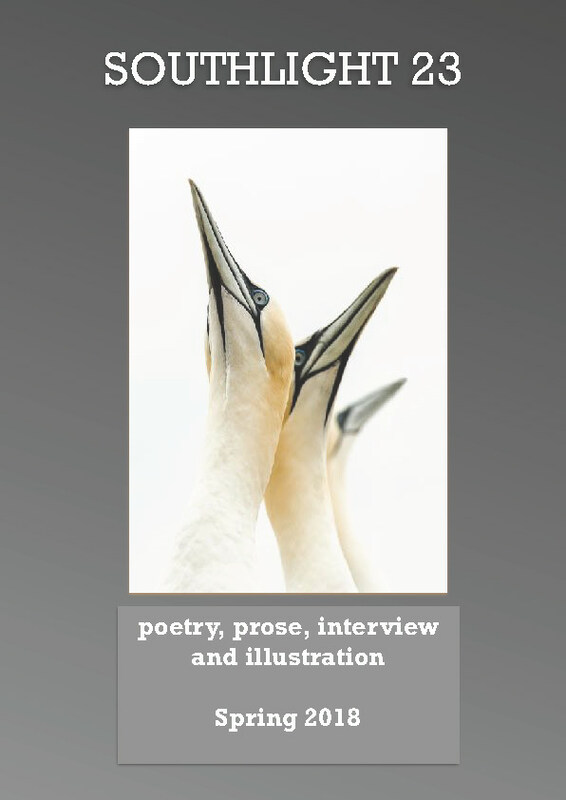 Multiple entries: the %uFB01rst three poems cost a total of £17.00. 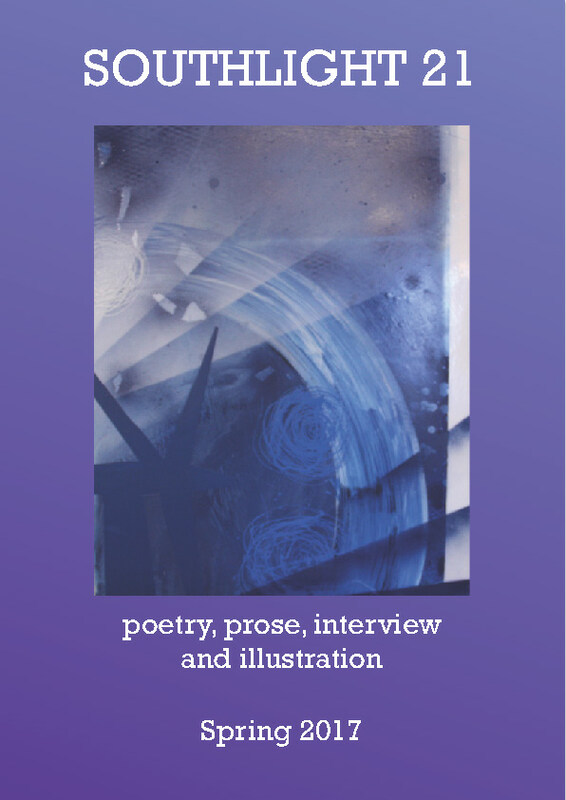 1 poem £6.50; 2 poems £13; 3 poems £17; 4 poems £22; 5 poems £27; 6 poems £29; 7 poems £34; 8 poems £39; 9 poems £41; 10 poems £46; 11 poems £51; 12 poems £53 etc. Are you a writer living in Dumfries & Galloway looking to develop your work with the help of professional advice and support? 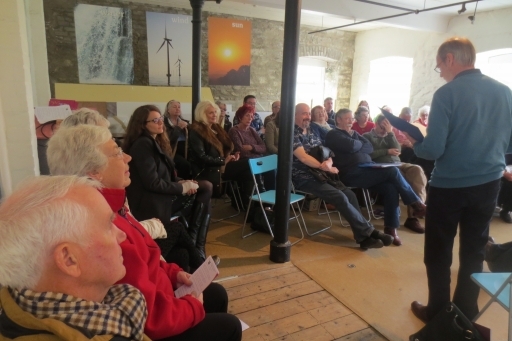 Applications are invited for a new mentoring scheme in spring of 2016, run by Wigtown Festival Company. Applicants will be expected to be able to demonstrate commitment to writing and examples of work, published or unpublished, on which they can work with their mentor. (For example, three to four chapters of a novel, or several short stories/poems; or a strong synopsis, character outlines and first chapter). Mentoring will be provided by professional writers, selected according to the needs of the person mentored. Applications from people of all ages will be considered and it is intended to select at least one young person (14-26) as part of the scheme. Reasonable travel expenses will be paid. * 1000-word sample of your writing (or equivalent for poets). * 500-word statement, specifying why you would benefit from free mentoring and detailing experience to date. Closing date 5pm 19 February 2016. Congratulations to our literature animateur and Southlight editor, Vivien Jones, who is one of 26 writers, including former Poet Laureate Sir Andrew Motion, paired with 26 objects from the Foundling Museum Collection in London. Each writer created one of 26 ‘sestudes’ – texts exactly 62 words long - to bring fresh perspectives to familiar objects and put those lesser-known in the spotlight. brief reading and conversation with the writers, free events. - sometimes in pubs, sometimes at tea-parties - always in good company. 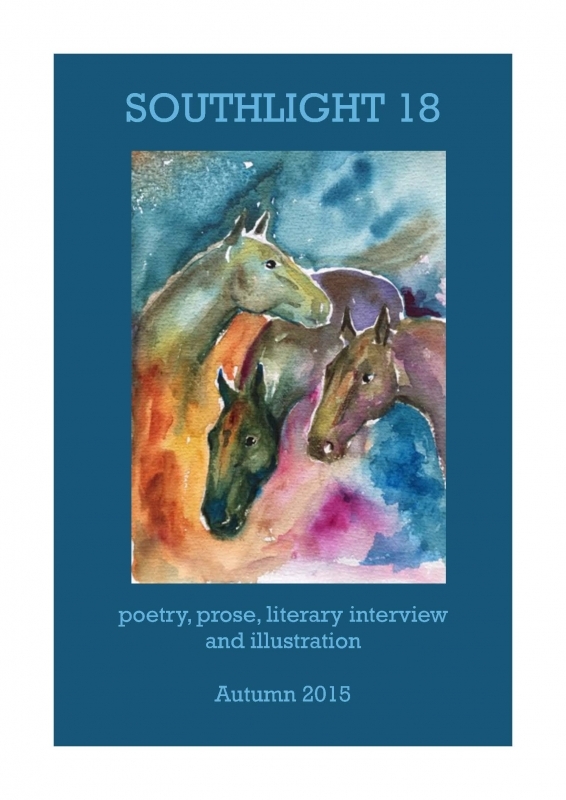 The first edition of Southlight appeared in the Spring of 2006. 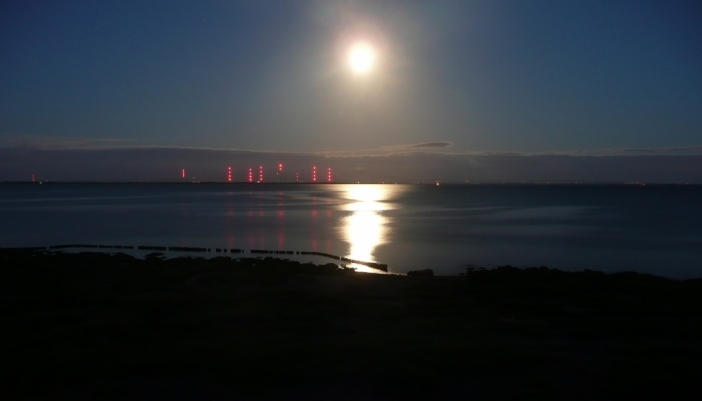 It was the brain-child of a group of writers living and working in Dumfries and Galloway,working with the Literature Development Officer, then Andrew Forster. From the start it enjoyed goodwill and office-space of the Crichton Campus (University of Glasgow) where the author and poet, Tom Pow, was leading a creative writing course. 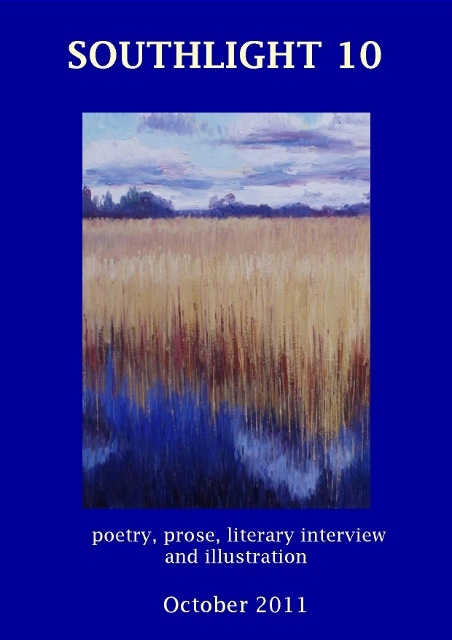 Its hope was to reflect not only the best writing in the area in this magazine, but also to provide a reputable platform for writers from any corner of the literary globe. Issues 1 to 6 fulfilled this purpose so well that the local arts association - dgArts, with its new Literature Development Officer, Carolyn Yates - were approached in 2010 for financial support towards raising production values. Thus, Southlight, went from 40 pages of photocopied A5 in a red cover to 50 pages of illustrated A4 with each cover featuring an artist. 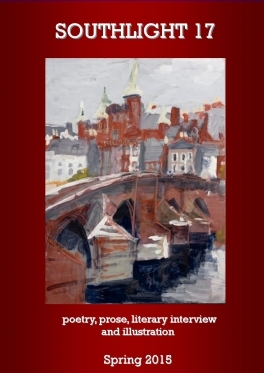 When dgArts ceased trading in 2011, Carolyn Yates ensured its continued publication thanks to a donation from The David Summers Trust (an arts charity founded in the memory of a local poet) under the auspices of the Wigtown Festival Company.